Gone are the days where women have been cornerstone only for the home and they are now becoming the superstar of their homes and offices, some women have even crossed this boundary, chartered unknown territories unabashedly and fearlessly and stand as the most successful Sheprenuers. According to the survey, 126 million women started and running their own business and 98 million women are operating the business which is established globally. They are successful in almost all the fields, be it in e-commerce, education, finance, travel, fashion, retail, fitness, hiring, and anything and everything under the sun, they are proceeding with gumption and unbridled enthusiasm to change the world around them, make a difference with their ideas, seek solutions that have never been sought, fight diseases and social norms, run successful ventures and generate employment for many, and give rise to newly sustainable ecosystems. Though India stands first at encouraging the gender-gap, women are focusing more and following their dreams and understanding the right business path. It is always believed that woman are born multi-taskers and they are proving it by being as a housewife managing chores at home, a successful mother raising the kids and being as a successful employee or a manager or a Sheprenuer who inspire other women in their localities to pursue their dreams through entrepreneurship at the grassroots level. Some woman doesn’t need a place a great investment or partnership, all they need is a Smartphone and the Social Media to turn their passion into Business. Each of them is scripting her own success story in today’s new age world. Sharing the list of Sheprenuers on this Women’s Day who has set benchmarks in the chosen fields. She is one of the top ten Vloggers in India. She is YouTube star Chef. Her vegetarian recipes from different resourceful states if India makes anyone crave for trying to some of her yummy recipes. Her love for cooking and passion for casting the recipes while cooking made her be as one of the Top YouTube vloggers of India who are also the Top 10 millionaire Youtubers of India. Sairee Chahal is the founder of the World’s largest network for women delivered via growth channels of community, content, champions, conversations, commerce, and companies. The SHEROES Community has access to high growth career resources, mentorship and support. SHEROES involves with companies to support them and connecting with female talent in form of employees, partners, consumers and business owners. Sairee is a believer in the work-life redesign, serial entrepreneur, mentor, an occasional writer and won Cartier Women’s Award Initiative for 2012 alumni, a TED speaker. Aravinda understood how digital marketing is swaying amongst all the trends and started an organization which provides digital marketing services to all the clients.Aravinda is a motivated and dedicated digital marketing and branding strategist, best known for her efficient and effective marketing initiatives that promote value, growth, revenue and leverage brand awareness. She stands she fifth YouTubers in India. She runs a Youtube channel which presents the videos of DIY hairstyle, makeup etc. Shruti has perfect makeup tips for you according to your skin tone. She makes decent videos and they consist content of outfits for you today, hairstyle and makeup tutorials. In 2011, while in between jobs, she cast a video and uploaded it to YouTube for a lark. She soon made it a weekly habit, by 2013, Anand and her husband had moved back to India; her YouTube uploads continued, and her popularity was slowly but surely growing. Falguni Nayar started her career 25 years ago as a banker, later she quit the job and become a sheprenuer for an e-store called Nykaa – a women-centric e-commerce portal providing beauty and wellness products. She focused on providing the best beauty and wellness products, the startup targets the urban women of modern India. They are millions of users till date who uses Nykaa for buying the cosmetics, perfumes, lingerie and many products which women love to use on a regular basis. Jahnavi Dasetty was just another girl dreaming of doing something creative and not become just another engineer and doctor. Her enthusiasm and passion got her an admission in NIFT, Hyderabad and in due course, a short film stint. .After grabbing the label as the short-film star, she began making a comedy web series Mahathalli-Mahanubhavudu, the name thereby sticking to her image. 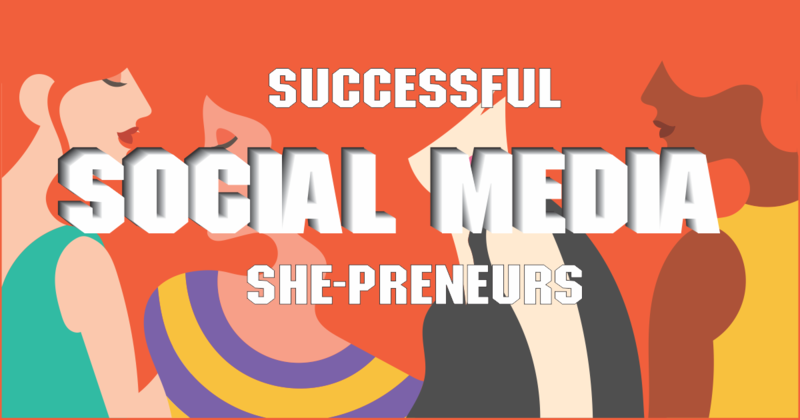 The success of Mahathalli resulted in gaining more subscribers and gaining the good fame on YouTube. Jesrani started her career as a graphic designer and she makes personalized as well as designer pieces with glass beads and metal ranging from a modest Rs. 1,000 up to Rs. 40,000. She has a very interactive Facebook page and always stays personally connected to her clients in New York, Dubai, and cities across India. Besides, she also retails from fashion stores like Electric in Mumbai and Bloom in the national capital. Later turned her passion for baking to business. With the only source of Facebook and WhatsApp, she earned a lot of followers and earned business. Sanjukta Basu wears many feathers in her cap. She is a writer, a wedding photographer, and a feminist blogger. She portrays all her travelling experiences of being a Single Woman Budget Traveller. She has started Sanjukta Media, a social media communication consultancy firm. Sanjukta is a great social enthusiast and has been awarded a TED fellowship for her blogging and social media activities. Jyoti Chauhan is the most successful female bloggers in India 2017. Her blogging skills have helped other people who also want to learn to blog. Chauhan has been earning through internet. She always has a dream of creating blogs that are of high quality. Shivya Nath is a Techy person who quit her corporate job to achieve her passion of travelling the world and became a Travel Blogger. She sold everything right from her home, car and set a backpack which suits her wanderlust and made the road to her home. Her blog consists of the pictures she travelled along with the pros and cons of the place. She is a successful blogger with the years of experience and got featured on National Geographic Traveller magazine, BBC Travel, Indian Travel, NDTV, she is awarded as the Best Indian Travel, Blogger of the Year 2017. Dilkush Dheeraja is a quintessential Youtuber. She entertains her viewers with her charismatic expressions, she perfectly fits the role she chose. She portrays multiple people, with an unravelling ease, and manages to invoke incredible happiness. That’s her in a nutshell.Anyone would be super impressed by her versatility and awesomeness. These are the two backbones of Popxo which is the best media for the woman to share, write and interact with the community. Priyanka met Namrata Bostrom, and since both of them were looking at digital content space for women, they came up with the idea of the digital lifestyle magazine for women and co-founded Popxo.comin early 2014.The startup has recently raised approximately $2 Mn in its Series A funding round this November to broaden its editorial operations in English and Hindi language. According to the projections, Popxo will have 300 Mn women users by the end of 2020. Inspiring isn’t it? If even you have the aspiration to become one or following your passion by becoming a blogger, Content writer, Youtuber or finding a job as a social media manager, SEO analyst, Digital Nest unveils the doors to help you. Head over to the institute today and get 15% off on the Course.